Are you considering renovating the outdated floors of your home? Have you always wanted the look and texture of hardwood floors without the expense? If so, then consider luxury vinyl tile for your home or commercial residence. Consumers everywhere are fast becoming aware of the vast qualities that make a luxury vinyl tile floor such an attractive surface. Its ability to replicate other surfaces, such as tile and hardwood, puts it in a league of its own. Our flooring showroom has a wide collection of different types of luxury vinyl that come in diverse patterns and designs. No matter what style or look you want, our knowledgeable staff can help you find something that suits your aesthetic preference. Featuring realistic looking designs and layers of cushioning comfort, this flooring combines style and value to make the perfect flooring material. A huge reason why LVT flooring installation has become so popular is because of its ability to replicate the high-end look of other flooring materials. Hardwood, marble, limestone, slate, and travertine are able to be replicated and usually at a fraction of the cost. It’s not just the look that LVT is able to mimic these flooring materials either. It almost feels like the actual material. You can feel the grooves and rich grain of hardwood and the cool touch of marble and tile. Technology has made it possible for luxury vinyl tile to achieve such amazing realism. LVT manufacturers take a photographic image of the natural material you select and then transfer it to tile. It’s then embossed and laser engraved to match the desired texture. The process has been perfected so well that it’s difficult tell which is the real material and which is LVT. Natural materials have the tendency to chip, warp or yellow over time. When you install a luxury vinyl tile floor though, you don’t have to worry about any of these occurring because LVT is resistant to warping, chipping, and yellowing. As long as the floor is properly taken care of, it should keep its rich, supple look for many years to come. Cleaning up spills and messes won’t be a problem because LVT is water resistant. That’s part of the reason why LVT is so popular in both home and business kitchens. All you need is a wet rag, a mop, and the manufacturer’s recommended cleaning solution to get your floor back to its original condition. Luxury vinyl tile isn’t only known for its visual appeal. It’s also very durable. The tiles are made up of several layers. The top layer is a protective layer that’s usually coated with urethane. This offers first-class protection and makes the tiles resistant to indentations, stains, scratches, and scuffs. If you have a busy household with small pets or children, these are the floors for you. There’s no shortage of creativity when it comes to this flooring. 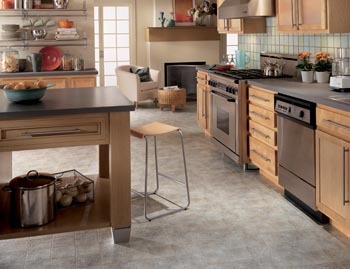 The high-end look that it is able to capture lets you create virtually any floor you desire. Whether you want wide, long planks of wood, oversized tiles, or muted-colored marble, LVT can give you the floors you’ve always wanted. Once you have selected the vinyl flooring you want, protect your investment by letting us handle the work of installing it for you. Installing your floors properly requires professional tools and equipment to ensure they’re installed correctly. Improper installation could cost you money in repairs down the road and we want to avoid that. Regardless of whether you are simply replacing the floor in one room, or throughout your entire property, we have the skills and tools to complete the job in a timely and efficient manner. We stand by our brands, products, and the quality of work from our installation specialists. However, we know that feeling protected makes you sleep just a little better at night. That’s why we offer a comprehensive warranty program that’s one of the best in the industry. Our Confidence Plus Warranty states that if you’re not happy with your 4- or 5-Star rated floors after 30 days for any reason, we’ll replace them free of charge. We also offer a Price Protection Guarantee. If you find a product of the same brand and style at a lower price from a competitor of ours, we’ll refund the difference. We offer these warranties because we want you to feel confident in your purchase and to know that you are a valued customer. Contact us to see how LVT can transform your space. We proudly serve the residents of Lexington Park, California, Leonardtown, Beauvue, and Saint Clements Bay, Maryland, as well as the surrounding areas.